If you had the choice to ride for a team in the pro peloton who would it be? The obvious cliché for a Brit would be the dark clad horde Team Sky arriving at each race behind the zero visibility tinted windows of the Death Star. Any why not? For your correspondent however the teams that hold the greatest appeal in this hypothesis aren’t necessarily the ones representing a home country or even the most winningest. It’s actually the teams that seem to genuinely embody that word ‘team’. The ones that represent the ‘one for all and all for one’ attitude. The outfit that exhibits this characteristic most of all is Orica Green Edge who seem to manage to win while looking as if they’re actually having fun. This isn’t a recent phenomenon, Orica announced that they wanted to do things a bit differently when the released their lip synced version of ‘Call Me Maybe’ at the end of the 2012 Vuelta. In a predominantly Australian team the ‘mateship’ between the riders and staff is clear, but it isn’t just limited to the Aussie riders on the team as shown in yesterdays TTT that opened the 2014 Giro d’Italia. Svein Tuft, one of three non Australian’s in Orica’s Giro line up, was (literally) gifted the Maglia Rosa on his 37th birthday by the team. In the absence of Omega Pharma Quick Step’s TTT A team (that only tends to appear at the world’s) Orica are one of, if not, the best TTT outfits out there and would have fancied themselves as contenders if not outright favourites to take the first stage around 23km of Belfast city centre. As the second team off the start ramp Orica would have a long wait to see if their time was going to be the best, but whatever the outcome Tuft was going to get his present as the team shuffled to ensure that he would be the first over the line. If Orica did end up with the quickest time Tuft would be in pink for his big day. In a possible glimpse of what we can expect for July’s Tour Grand Depart in Yorkshire the opening stage of this years Giro threw up the kind of weather that is synonymous with Britain; rain. OK, so it wasn’t exactly torrential but it looked as if someone at the city council had misunderstood what the race organisers mean when they ask for the road surface to be tidied up for a cycle race. Every bit of the course looked as if it had been given a fresh coat of paint with the riders having to negotiate bright white road stripes and bus lane signage throughout. 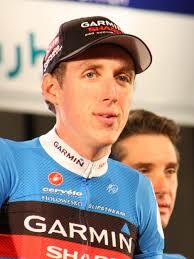 It wasn’t a bit of paint that did for Dan Martin. The Garmin rider’s high profile status thanks to his registration with the Irish cycling federation and team leader status for the race appears to have cursed him. As he rode up the chain gang in fifth wheel Martin appeared to be unsettled by a raised manhole cover and as he hit a second almost immediately after he was down. The three riders behind were skittled over by his stricken Cervelo and Martin was left in the wake of the accident clutching his shoulder. It soon became clear that Martin wasn’t going anywhere but the local A&E, his Giro over before he had even ridden the first stage. Martin’s exit made Joaquim Rodriguez’s time loss look insignificant in comparison, Katusha the next biggest losers out of the GC contenders. Giant underperformed to the extent that Marcel Kittel is unlikely to get a spell in the leaders jersey in Ireland at least. With heavy rain and thunderstorms forecast for today’s stage around the Antrim coast and back to Belfast it’s entirely possible that we could lose a few more riders thanks to typical early grand tour jitters and wet and crowded roads.